S/11066 Private Stanley Robinson, 1st Battalion, Gordon Highlanders was killed in action 25 September 1915 and is commemorated on the Ypres (Menin Gate) Memorial, Belgium. He was 21 years old and is commemorated on the Copley War Memorial and the Memorial Plaque in St. John the Evangelist Church, Lynesack. 28 September 1914: Stanley Robinson enlisted at Newcastle into the Gordon Highlanders being given the regimental number S/11066. He may have initially he joined the 4th Reserve Cavalry Regiment before being transferred 3 June 1915 to the 3rd Battalion, the Gordon Highlanders. 22 June 1915: He was posted to the 1st Battalion, the Gordon Highlanders. The battalion took heavy casualties at Le Cateau, 26 August 1914 and it saw further action throughout 1914 at the Battles of the Marne, Aisne, La Bassee and Messines and then the Battle of Ypres. In 1915, it was involved in the Winter Operations of 1914-15, the First Attack on Bellewaarde, the Actions at Hooge, 19 July and then the Second Attack on Bellewaarde, 25-26 September. 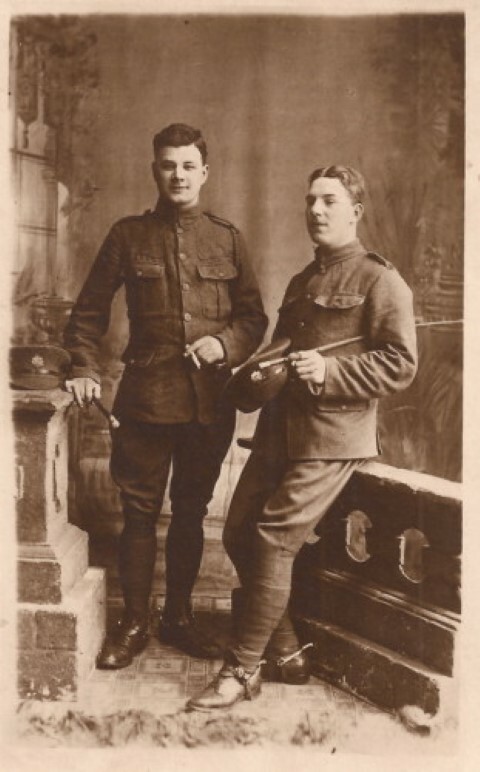 22 June 1915, Private S. Robinson entered France 1915, joining the battalion as a draft. He was killed in action 25 September 1915, this being the date of the commencement of the Battle of Loos. The battalion did not take part in the main show but subsidiary action in support, the Second Attack on Bellewaarde, to the north near Ypres. 19 July: delivered an attack on trenches at Hooge, some losses. September: back to the trenches at Hooge, relieved by 3/Worcesters 12 September. 13-17 September: Heavy bombardment by British artillery answered by the enemy. 25 September: big attack by 3rd and 14th Divisions with Royal Scots Fusiliers, 1/Gordons, 4/Gordons, 2/Royal Scots, 2/South Lancashire Regt., and Royal Irish Rifles involved. This attack was repulsed by the enemy whose trenches and wire were not affected by the heavy bombardment, the wire could not be cut by our cutters and very heavy casualties suffered. Returned to bivouac 26th and back to the trenches 29th September and attacked enemy occupied trenches. Later research records that between 25 and 30 September 1915, 1/Gordon Highlanders suffered 3 officers and 94 other ranks killed in action or died of wounds. 2 officers and 84 other ranks including Private S. Robinson were killed in action 25 September 1915. 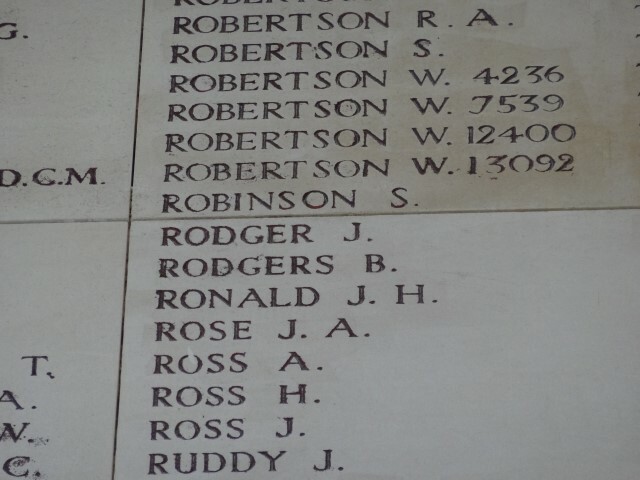 Private S. Robinson has no known grave and is commemorated on the Ypres (Menin Gate) Memorial. 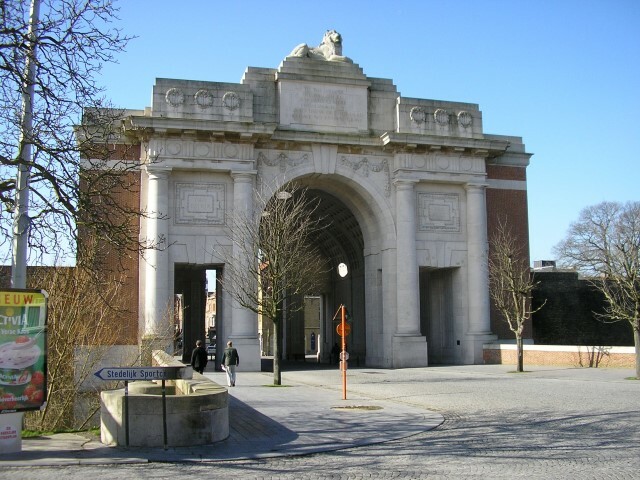 The Menin Gate is one of four memorials to the missing in Belgian Flanders which cover the area known as the Ypres Salient. Broadly speaking, the Salient stretched from Langemarck in the north to the northern edge in Ploegsteert Wood in the south but it varied in area and shape throughout the war. The site of the Menin Gate was chosen because of the hundreds of thousands of men who passed through it on their way to the battlefields. It commemorates casualties from the forces of Australia, Canada, India, South Africa and United Kingdom who died in the Salient and in the case of United Kingdom casualties, only those prior 16 August 1917 (with some exceptions). United Kingdom and New Zealand servicemen who died after that date are named on the memorial at Tyne Cot, a site which marks the furthest point reached by Commonwealth forces in Belgium until nearly the end of the war. Shiftman – Presumably a coal miner who shifts the stones and debris underground or at bank. 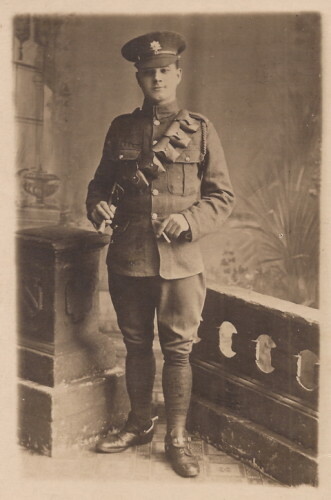 SDGW records that Bennett enlisted at Barnard Castle and Robinson at Newcastle.